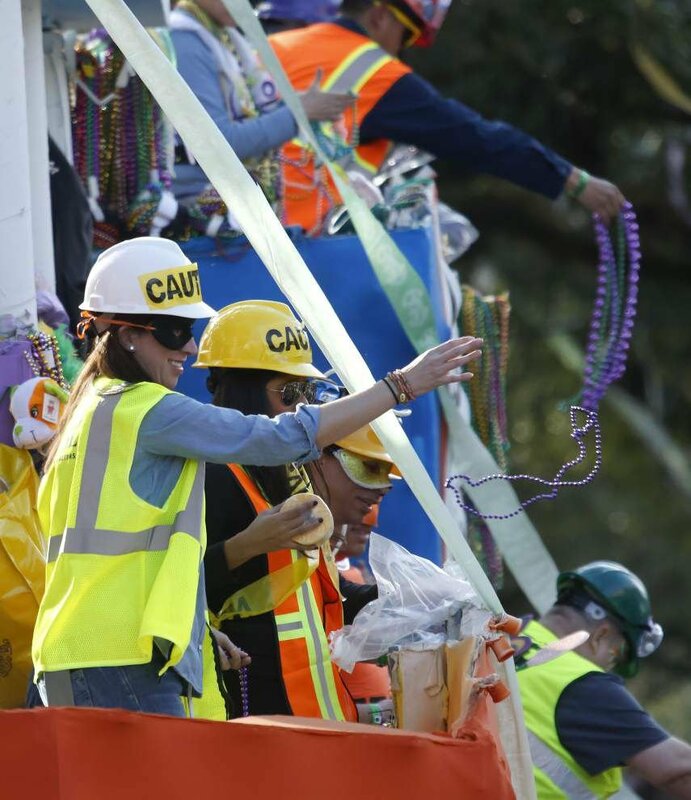 Advocate staff photo by SCOTT THRELKELD -- Riders toss beads and trinkets Saturday, Feb. 6, 2016, as the Krewe of Tucks rolls on the Uptown route to the theme, 'Tucks Visits the Hood.' More than 1,300 male and female riders on 41 super-sized floats tossed signature items including colored toilet paper, plastic squirting toilets, sunglasses, knee-high socks and dreadlocks headbands, as well as 10,000 toilet brushes decorated by Magnolia School's special adults. Marc Frischhertz reigned as king and Anne Eckert as queen. 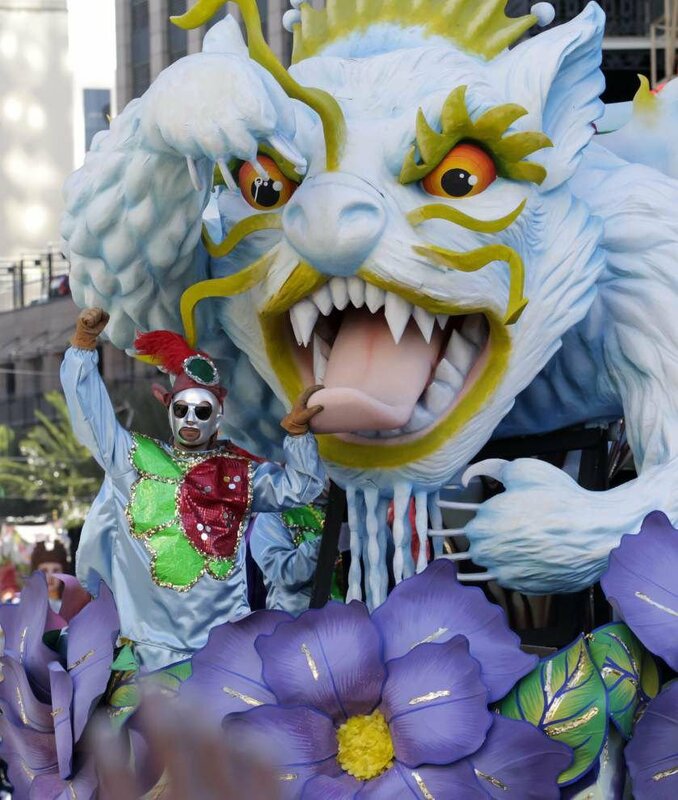 Advocate staff photo by SCOTT THRELKELD -- Riders throw beads and trinkets Tuesday, Feb. 9, 2016, as Rex rolls along St. Charles Avenue to the theme, 'Royal Gardens -- Horti Regis.' Some 455 riding members on 26 floats tossed float-specific beads, pillows, cups and gold aluminum doubloons. Michael Kearney reigned as Rex and Adelaide Dabezies Goodyear as queen. The Advocate answers your questions exploring the distinctive, often absurd, challenges of the season. Parking. Trying to find a bathroom. Getting smacked in the face with a bead — or a bag of beads. We all experience problems unique to Carnival. This year, we’re taking questions and sharing advice, reveling in the absurd dilemmas that make up the rich tapestry of Carnival. Your question has me thinking of a brilliant business idea: instead of saving spots on the parade route, all those gig-economy workers can become Mardi Gras baby sitters. Beleaguered spouses can free themselves while outsourcing the caretaking to a responsible party equipped with Gatorade, aspirin and knowledge of parade traffic. You sound like a lovely, caring wife. You also deserve a year off! You don’t mention whether you’ve broached this subject with your husband before, so I’ll give him the benefit of the doubt and assume that, despite whatever disappointment he may feel to lose his Florence Nightingale this year, he’ll be just fine. He’s a grown man; he can line up a ride, ask a friend to make sure he gets into it, and deposit himself at home in the manner of single people everywhere — by smashing some food into his face and passing out in his costume. Offer to let him off the hook for Nyx duty in exchange. If you want to get extra wifey points, you can set up a Carnival first aid kit in your bedroom and prep a meal (see the related question below). That way, you can do whatcha wanna, and both of you can look forward to a Lundi Gras spent recovering together and swapping tales of your adventures. You’re right. Pushing the limits of your body by attempting to subsist on fried and/or sugary carbs washed down with alcohol is a time-honored part of the season. But, as you’re learning, it doesn’t have to be this way. With a little advance planning, you can bypass those hungry remains of the day. Set aside a free night or afternoon, and pick out one grab-and-go dish and one eat-at-home dish to prepare. For the former, I love veggie-packed burritos. There are loads of recipes on the internet involving one sheet pan of roasted meat and veggies, a cans of beans, a pot of rice, and cheese. Freeze or refrigerate, then reheat before you head out for the day. If you have a slow cooker, Mardi Gras is its time to shine. One of my best food-related Carnival memories is my roommate and I coming home Mardi Gras night to a bubbling slow-cooker lasagna. Get the no-boil noodles, a jar of quality marinara, and your basic ricotta and shredded mozzarella, and it’s a cinch to put together. No slow cooker? Bake ahead of time and let it be a refrigerator surprise right when you need it most. I know the rule about getting the baby in the king cake and bringing the next one, but what if you're at a parade open house or neutral ground party? Carnival questions? Write to us at holidays@theadvocate.com.